My children have become much more aware of this year's presidential election than previous years. I think because they are older, they have a better understanding of what is going on. It also helps that Ted Cruz spoke about religious liberty at our church last fall. 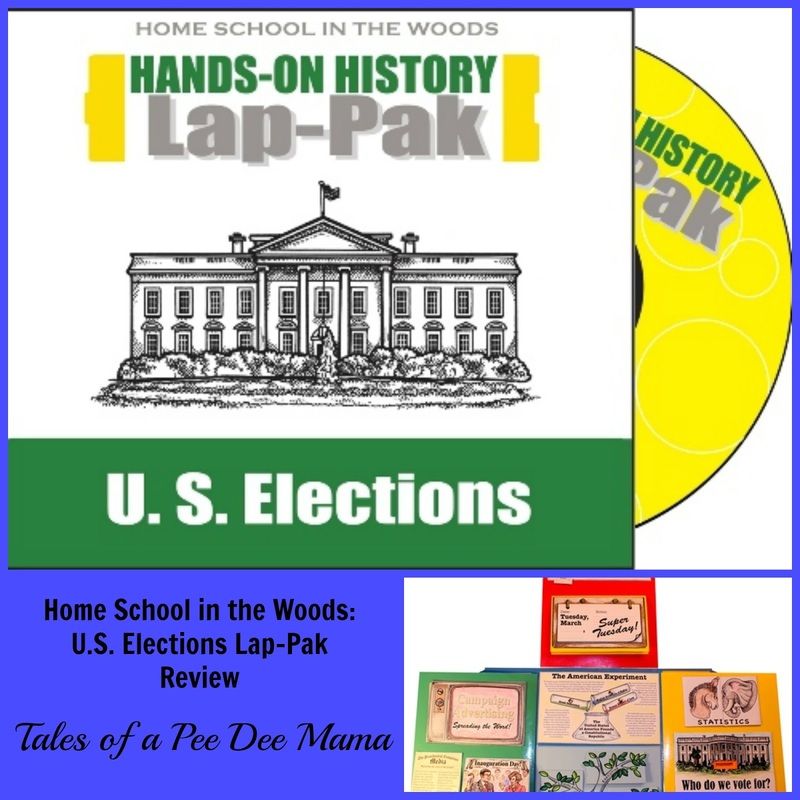 My girls have really enjoyed learning more about the election process by creating lapbooks using HISTORY Through the Ages Hands-On History Lap-Pak: U.S. Elections from Home School in the Woods. We've used other Home School in the Woods history studies before, so I knew that my girls would have the opportunity to learn a lot as well as do many hands-on projects. 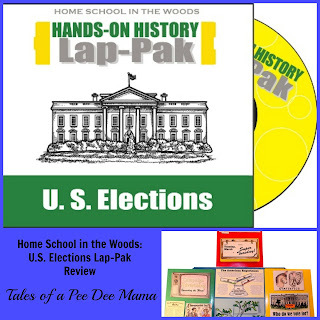 For this review, we received a digital download of Hands-On History Lap-Pak: U.S. Elections. I discovered long ago that my children learn best when they can interact with what they are learning. Being able to create projects about the election process really helped to bring this to life for my girls. Each section in the reading text has a corresponding project for the lapbook. Some days we would do the reading and the project on the same day. Other days, there was so much information and discussion about how what we read applies to this presidential election that we would do the reading and the project on separate days. 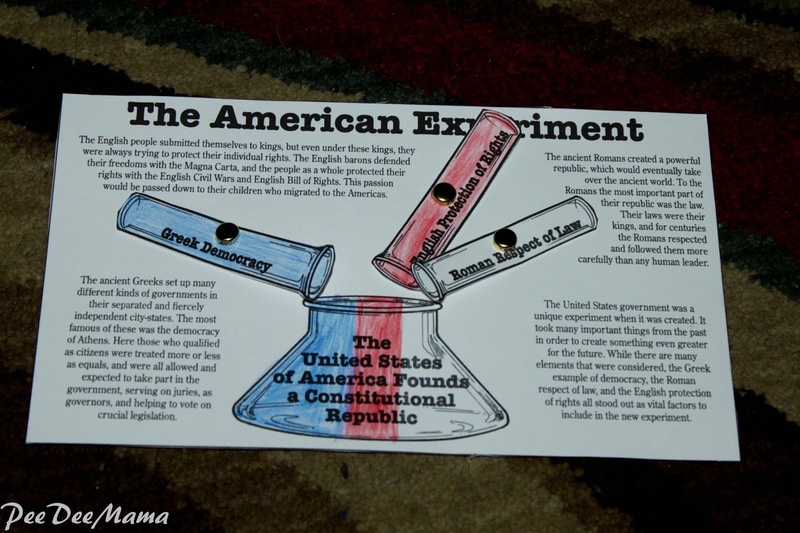 The reading text begins by discussing the history of elections in the United States and how the Founding Fathers looked to the Greeks, Romans, and English when they designed our government. Ballerina was very creative when she did the project that went with this reading - creating a red, white, and blue final product. Here in South Carolina, we have our Republican primary this Saturday and the Democratic primary next Saturday. This made it extremely interesting when we read this past week about the difference between caucuses and primaries. We were able to discuss how New Hampshire used the caucus system and how the primary system will work for South Carolina over the next couple of weekends. I was also impressed that the reading text and related project on the political parties focused on the history of political parties in the United States, as well as talking about several third parties and their political belief systems. It was very eye-opening for my girls to learn that, although the media mainly focuses on Republicans and Democrats, those are not the only political parties that will have candidates running for president this year. Sassy (age 8) - I liked the projects because they were interesting, and I liked learning about all of the different stuff about voting. Little Red (age 11) - I liked this because it taught me stuff I didn't know about the elections. Ballerina (age 12) - I found this topic interesting, and it taught me a lot about the way elections work and the history behind them. Soccer Girl (age 12) - I enjoyed learning about the different political parties and learning that there are more than just the 2 main ones that we hear about. Since the final presidential election is not until November, there is a lot of time to use this lapbook to learn about how elections work. I think this knowledge is an essential part of learning history. Are you interested in what others have thought about the U.S. Elections Lap-Pak? Check out more reviews from the Schoolhouse Review Crew.